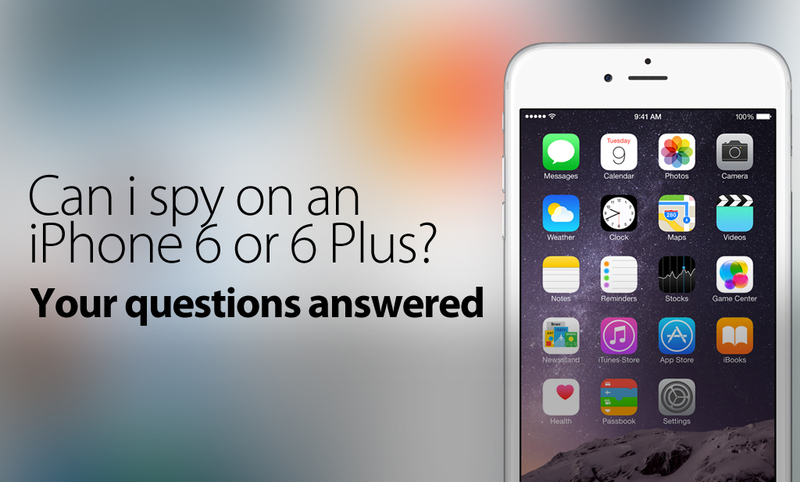 How Can I Spy On An iPhone 6 Or An iPhone 6 Plus? You can now spy on up to iOS 8.1.2 with FlexiSPY. Both FlexiSPY PREMIUM & FlexiSPY EXTREME are compatible with this latest jailbreak. Currently FlexiSPY (And all other mobile spy software) Do Not Support iOS 8 as there isn’t a jailbreak out for it yet. Please Do Not Update To iOS8. You can prevent the iOS 8 update by reading the section in the article called: Can You Stop iOS 8 From Being Updated By The User And Losing The Jailbreak? With the release of iOS8, the iPhone 6, and iPhone 6 plus, many people are wondering if it’s still going to be possible to install mobile spy software onto their Apple devices. The answer in short, is yes, You will be able to Spy on an iPhone 6, an iPhone 6 Plus, a device running iOS8, and possibly even the iWatch. However, the question that can’t be answered definitely yet, is: When Can I Spy On These New Devices? In this article we will answer some of the most common questions that we get from people, if you have after finishing the article, please contact us in the comments section at the bottom of the page. Mobile spy software for iOS devices (such as the iPhone 6, 6 Plus, etc) all rely on the target phone being Jailbroken. This means that no mobile spy software can claim to work on an iOS device unless there’s been a jailbreak released for that iOS version. And currently, there is no jailbreak for iOS8. So again, Without the ability to jailbreak any iOS 8 device such as the iPhone 6, iPhone 6 Plus or Apple Watch it is not possible yet to install any spy phone software onto the device. How Long Will It Be Before I Can Jailbreak The iPhone 6? The time it takes for the latest version of iOS 8 to be released and the time it then takes for clever hackers to jailbreak the iOS (it is not something done by FlexiSPY in any way) can vary significantly. Actually it is taking longer and longer for a jailbreak to appear after the release of the latest version of iOS due to Apple making it more and more secure and thus fixing the exploits that jailbreak teams such as Evad3rs used to jailbreak the device. Ironically, when Apple released iOS 6.1.3 (which killed the iOS 6.1.2 jailbreak by Evad3rs) they actually credited the Evad3rs team for helping them fix it by finding the issues and exploits that Apple patched to make iOS 6.1.3 possible. 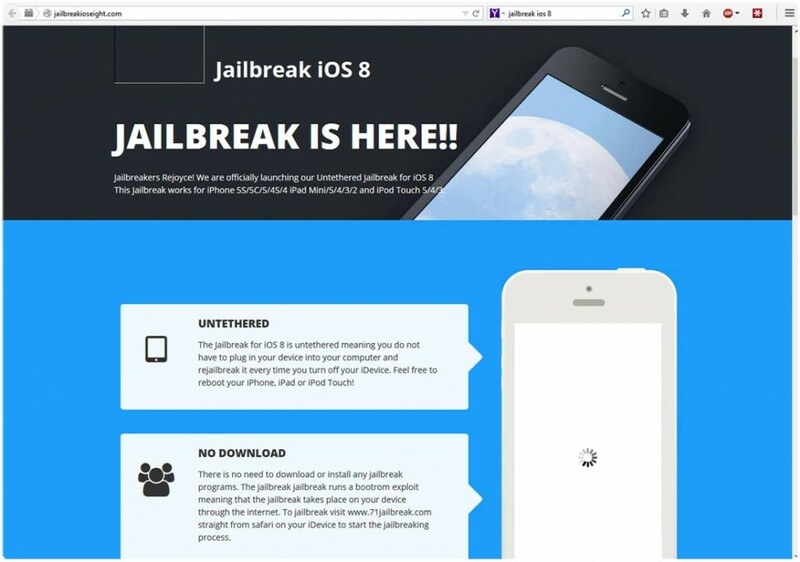 Please be aware that there are currently many scam sites already advertising ways to jailbreak iOS 8 and these are all false – please be careful. You should follow one of our social media channels if you want to be the first to know when the jailbreak comes out. Here’s what one of these sites can look like, so be careful. Why is it taking so long to jailbreak iOS 8? iOS beta versions can be jailbroken but this does not mean the final version can be. At the time of writing (September 11th 2014) iOS 8 is not even out officially to the public and neither is the iPhone 6, iPhone 6 Plus and the Apple Watch is scheduled for the early part of 2015 so unfortunately you simply must wait. Once iOS 8 is released publicly people will start to look at ways to jailbreak it. This could be easy, it could be hard. For those that are unaware the last jailbreak for iOS 7.1.x came from a Chinese hacking group and was called Pangu. During tests of the jailbreak it still worked on the iOS 8 beta versions but this is no way indicative to say that the same jailbreak will work on the final version of iOS 8.
iOS 8 Tethered and Untethered Jailbreaks – What Are They? Untethered jailbreaks are always the best but take longest to arrive and no jailbreak is truly permanent. Once someone figures out how to jailbreak iOS 8 when it is released to the public it will be tethered only to start with. This is always the case. A tethered jailbreak is essentially the ‘quick and dirty’ way just to prove a jailbreak can be done and it is usually complex (the process is as technical as it gets before it is streamlined to make it easier for public consumption) and it also has one main caveat which is explained below. Tethered jailbreak – As soon as the iPhone is turned off or rebooted or loses power the jailbreak will be lost and, to boot up the phone to even use it you must connect it to your PC and then you have to jailbreak again and the process repeats until the phone is rebooted or loses power or turns off (rinse and repeat). As you can see, this is not ideal at all and this is why FlexiSPY does not start to develop software until an untethered jailbreak is available. For a tethered jailbreak, not only would the person need to keep rejailbreaking the phone but every time the jailbreak is lost FlexiSPY would need to be physically installed again and this is just not ideal. Of course if Apple update iOS 8 in the meantime and people upgrade to that then it can mean the tethered jailbreak no longer works which further means the wait for an untethered jailbreak increases. FlexiSPY understands that people cannot get the iPhone’s they wish to track all the time to keep jailbreaking it all the time if the jailbreak is tethered. Furthermore, from a development perspective, an untethered jailbreak is far safer to work with than a tethered one because an untethered jailbreak is permanent unless the iPhone is factory reset. A tethered jailbreak is the first to be available but is not really worth it. Untethered jailbreak – An untethered jailbreak takes the longest but it is the jailbreak that everyone wants and FlexiSPY prefers. An untethered jailbreak is permanent once applied unless the device is factory reset or upgraded to a new iOS version from Apple that fixes the exploits used in the untethered jailbreak (which means it is back to square one – waiting for a jailbreak for the new iOS 8 version and this is nothing to do with FlexiSPY). Untethered jailbreaks are what everybody really wants, including FlexiSPY, but the wait for them to appear gets longer and longer. Can You Stop iOS 8 From Being Updated By The User And Losing The Jailbreak? Nobody knows at this time but, in theory, if you can do it on iOS 7.x then iOS 8 should be able to also – given time. Now there are Cydia tweaks for iOS 7.x that you can get such as Recoveryguard that trick iOS in to thinking that the version installed is the latest one which stops the iPhone owner from being able to upgrade the iOS directly from the iPhone itself. However this does not apply if the iPhone is factory restored in iTunes as iTunes always checks for the latest iOS version before it restores or if the iOS is updated from ITunes itself. Please note that at the time of writing nobody knows if Recoveryguard is compatible with iOS 8 once it is released but it works fine in iOS 7 providing you have jailbroken the phone. You can install RecoveryGuard by adding the Cydia source http://cydia.pushfix.info to your list of Cydia sources and then tapping that source and finding RecoveryGuard and installing it the same as you installed FlexiSPY or any other Cydia program. Unfortunately though RecoveryGuard is a tweak you can only get through Cydia and you get Cydia by, yes, you guessed it, jailbreaking the phone so the people who create these tweaks also have to wait for iOS 8 to be jailbroken so that they can update their applications and make them compatible – the same as FlexiSPY. Can I Spy On Someone’s Apple iWatch? We are not sure if people want spy phone software for the Apple Watch. If you are interested, let us know in the comments and we will be sure to look in to it. The Apple Watch still requires an iPhone to be tethered to it in order to receive notifications (you basically look at the watch on your wrist instead of pulling the iPhone out of your pocket instead – but not much more than that) so it may just be better to wait for FlexiSPY to fully support iOS 8 (which will run on the iPhone 4S, iPhone 5, iPhone 5S, iPhone 5 C, iPhone 6, iPhone 6 Plus, Apple Watch and all iPad generations starting from the iPad 2) instead so you can spy on the actual iPhone tethered to the Apple Watch and not the Apple Watch itself. How long do we need to wait for FlexiSPY? The Gold Master (final version) of iOS 8 was just released so our developers are getting to grips with that to see the new features and how we add even more great new features in to FlexiSPY but, as said, with no jailbreak there is not much we can do right no except speculate what we can do and just wait for any kind of jailbreak (tethered or untethered) and test our theories and get FlexISPY working. In the meantime though don’t forget that FlexiSPY still works on iPhone’s and iPad’s that have been jailbroken. This is something we will of course retain in our software for iOS 8, our software can hide Cydia too meaning that, whether it is iOS 7 or iOS 8 you have just jailbroken to install FlexiSPY you can hide all traces of the jailbreak (Cydia) and our software also hides itself completely too for complete stealth.There’s actually a guide for doing so, here. Currently this is the latest situation regarding FlexiSPY and iOS 8 and the new iPhone 6, iPhone 6 Plus and Apple Watch. However we will be sure to update this article with any new information regarding when FlexiSPY is available for iOS 8 but, in the meantime, join us as we all patiently wait for the iOS 8 jailbreak to arrive. To make sure you’re up to date with the jailbreak, please follow us on one of our social media channels.